An atomic bargain with the GOP? Nukes, nukes, and … nukes. These days, when it comes to energy and climate change, that seems to be all Republicans want to talk about. Throughout last week's hearings on the Senate climate bill, Lamar Alexander kept interjecting that a massive ramp-up of nuclear power was the only real solution to global warming, bringing up the subject at every turn. For many of his colleagues, it's one of the few energy ideas that piques any interest at all. "Certainly, nuclear production, advancing that would be important to my side of the aisle--regardless of what bill you are talking about," Bob Corker declared. That view is not wholly without merit. Many projections for a low-carbon future do envision a supporting role for nuclear power--indeed, a cap-and-trade system for greenhouse gases, by making fossil fuels pricier, could help usher in the first new wave of reactors in the United States since the 1970s. But that's not enough for the GOP, which wants to put nuclear into overdrive. 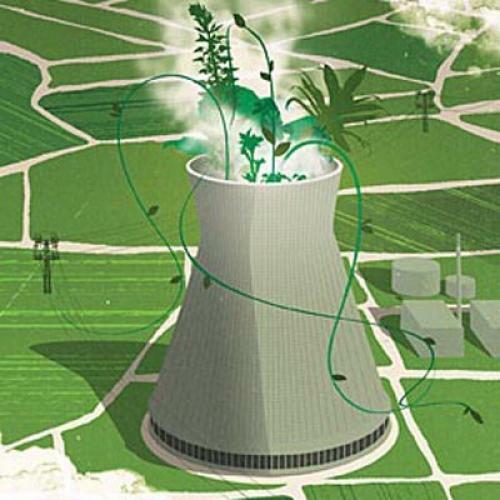 The party's energy plan, released in July, calls for a whopping 100 new reactors built by 2030. That's twice as many as even the most optimistic industry forecasts envision, and, given that the plants are estimated to cost at least $6-$10 billion a pop and have difficulty attracting private investment, they would likely need hefty subsidies--something the right is supposed to frown at. "For reasons I don't fully understand," says Joe Romm of the Center for American Progress, "nuclear power has a magical place in the hearts of conservatives." The debate over nukes has long exacerbated the deadlock over climate policy. Of the handful of Republicans who think global warming is a serious problem--like Alexander--most refuse to address it unless nuclear power gets a starring role. But many Democrats and green groups are loath to lavish even more money on an industry that has received countless subsidies to date--including $18.5 billion in federal loan guarantees in 2005--yet still struggles to procure financing for new plants, to say nothing of concerns about safety and waste disposal. John McCain has chalked up his refusal to support the very cap-and-trade policies he once championed to "left-wing environmentalist organizations that are not allowing us to move forward with nuclear power." Now, however, that deadlock may be dissolving. In October, John Kerry, the lead sponsor of the Senate cap-and-trade bill, co-authored a New York Times op-ed with Republican Lindsey Graham outlining a possible bipartisan deal that would include offshore drilling and nukes. "Nuclear power needs to be a core component of electricity generation if we are to meet our emission reduction targets," they wrote, endorsing the need to "jettison cumbersome regulations" and help utilities "secure financing for more plants." Graham has hinted that sufficient nuclear incentives could get "at least half a dozen" Republicans on board--allowing a climate bill to squeak through the Senate. As a result, many liberals and environmental groups are gritting their teeth and nervously bracing for a possible compromise. But that raises the question: If Democrats do haggle on nukes, will Republicans actually step up and agree to tackle global warming? Tracing the GOP's love affair with the atom isn't easy. For much of the postwar era, nuclear power had broad bipartisan support in Congress. It wasn't until the early 1970s, when environmental and consumer groups began fretting about issues like reactor safety, that divisions emerged. "Democrats started advocating a slower approach, with tougher regulations, rather than the all-engines approach that had been the norm," says Robert Duffy, author of Nuclear Politics in America. In the 1980s, as one nuclear project after another stalled in the face of cost overruns, conservatives blamed excessive regulations and green meddling for the industry's woes. Even as Ronald Reagan's Nuclear Regulatory Commission was revising rules to make it easier for utilities to build plants, says Duffy, "there was always this perspective that government was to blame." The battle lines of this earlier clash are still visible today. McCain, for one, "feels instinctively that nuclear has been dealt an unfair hand," as one of his campaign advisers told me last year. Alexander was governor of Tennessee in the 1980s when the Tennessee Valley Authority, much to his chagrin, mothballed three planned reactors due to soaring costs. Local politics matter, too: Graham's state of South Carolina is home to seven reactors, and his political campaigns have relied on generous support from nuclear utilities. Plus, of course, hyping a low-carbon energy source lets conservatives scoff at environmentalists for not being "serious" about global warming. Whatever the reason, the issue has often thrown a wrench in climate politics. When McCain brought his cap-and-trade bill up for a vote in 2005, he added a slew of nuclear subsidies--and lost four liberal Democrats who had voted for his 2003 version, including Barbara Boxer, Tom Harkin, and Russ Feingold. When, in 2007, Joe Lieberman and Virginia Republican John Warner put forward their own cap-and-trade bill, they shied away from nuclear altogether--and lost McCain. "We wanted to discuss it, but we were hamstrung by what we could get through working with Boxer," recalls Chelsea Maxwell, a former Warner aide. Now that a climate bill has a realistic shot at passing, however, liberals may be softening their stance. In October, President Obama told a town-hall crowd in New Orleans, "There's no reason why, technologically, we can't employ nuclear power in a safe and effective way." (Alex Flint, a lobbyist for the Nuclear Energy Institute, or NEI, pointed to Obama's remarks as a sign that the tide was turning.) Boxer, who is co-sponsoring the Senate climate bill, may not be thrilled with the idea of more goodies for the nuclear industry, but she did allow Tom Carper, a pro-nuke Democrat, to draft a few small provisions on things like training new nuclear engineers. Even Harkin, a staunch nuclear critic, is staying cautious: While he thinks the industry gets enough support as is, Senate sources say he's still in wait-and-see mode. "Right now, everyone's staying open-minded," says one staffer working on the issue. Granted, much depends on what nuclear backers actually ask for. NEI recently circulated a wish-list to Congress calling for new tax breaks and a green bank that would dole out $100 billion in loan guarantees for clean-tech projects, including nuclear. Critics fear a disproportionate focus on nukes would crowd out more cost-effective energy projects and tie up money in plants that can take a decade to build and have a high risk of default. (A 2009 Moody's report called new reactors a "‘bet the farm' endeavor for most companies" and said that federal support would only "modestly" mitigate this risk.) More contentious still, NEI and its allies have stressed the need to "streamline" the licensing process and reduce the delays that have plagued the industry and scared off investors. At the moment, few environmental groups will publicly say what their red lines on nuclear are, but, privately, some suggest that any moves to weaken safety oversight or restrict public participation over the siting of new plants could repel even moderate greens. "There are a lot of very technical issues at stake here, and we don't think Congress should be tying the Nuclear Regulatory Commission's hands," says Ed Lyman of the Union of Concerned Scientists, a nuclear watchdog organization. Plus, there's little point in acceding to the GOP's nuclear demands without getting anything in return. Alexander, for one, recently admitted that, even though he's taking part in talks over new nuclear provisions, nothing will persuade him to support a cap on carbon--which is the crux of any climate bill. "That's something to watch out for," grumbles one observer. "Is NEI actually going to work to bring new votes to the table?" Perhaps it's finally time to see just how much this love affair is worth. Bradford Plumer is an assistant editor of The New Republic.